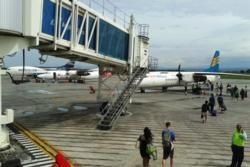 Finally Lombok now has an international airport worthy of its status as a tropical tourist haven on the rise. 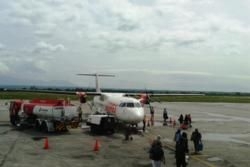 After a series of trials, tribulations and delays, Lombok International Airport (LOP) finally opened in October 2011. It took over from the now closed Selaparang Airport in Mataram and is located around 90 minutes drive south of the island capital at Tanak Awuand in close proximity to the regional city of Praya and the south coast surfer’s paradise of Kuta. Once time consuming to get to, Kuta has already seen a significant boost in visitor numbers on the back of its handy location to the airport and the added benefit of much improved infrastructure in the area. There is great optimism in Lombok that ithe international standard facilities will attract more airlines to the island and that it can eventually become an important hub for destinations in eastern Indonesia. The latest airline to be captivated by Lombok is low cost carrier Air Asia, which began a Kuala Lumpur-Lombok service in late 2012, which spells great news for budget travellers. At present the only other international service to Lombok is a scheduled service from Singapore by Silkair. 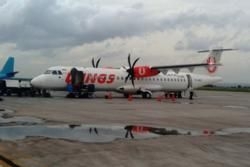 Domestically, Lombok has regular flights to Indonesia’s two biggest air hubs – Jakarta and Surabaya, the short 25-minute hop to Bali several times a day and regular flights east to Bima in Sumbawa. The airport’s single runway has the capacity to accommodate wide-bodied aircraft so there is a lot of scope to attract more regional and international carriers from further afield. The airport terminal itself is bright and spacious and can accommodate up to 2.5 million passengers a year at present. It is streamlined and designed for efficiency and rarely ever feels overcrowded. You will find all the usual basic facilities here – a main passenger terminal with separate domestic and international arrivals and departures hall, visa on arrival, a spacious passenger lounge with retail concessions, a VIP terminal and expansive car parking. Airport Taksi is the official taxi operator at the airport and there are abundant metered taxis awaiting each flight arrival. The official aiport taxis has a stand just before you leave the baggage hall and needs to be booked before leaving this area. You pay a set price depending on your destination. This is supplemented by two further reputable taxi companies, Bluebird Taxi and Express Taxi. All use a metered system to calculate the fare and there is also the inevitable band of local taxi touts loitering in the arrivals area. Journey time by taxi from the airport to Senggigi or Mataram is around 90 minutes. Additionally, there is a bus shuttle service from the airport to Mandalika terminal on the eastern outskirts of Mataram or direct to the beach resort of Senggigi. Both routes are operated by DAMRI Bus using 40-seater modern vehicles at scheduled times to coincide with flight arrivals.